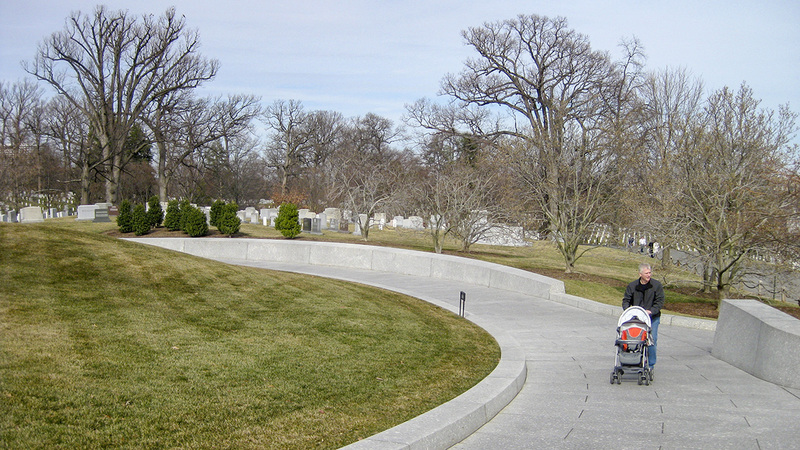 Following John F. Kennedy’s assassination on November 22, 1963, First Lady Jacqueline Kennedy selected John Carl Warnecke to design the three-acre gravesite at Arlington National Cemetery. Warnecke had a long-standing association with the family, having met the President in Washington, D.C. and maintained a relationship with the couple ever since. 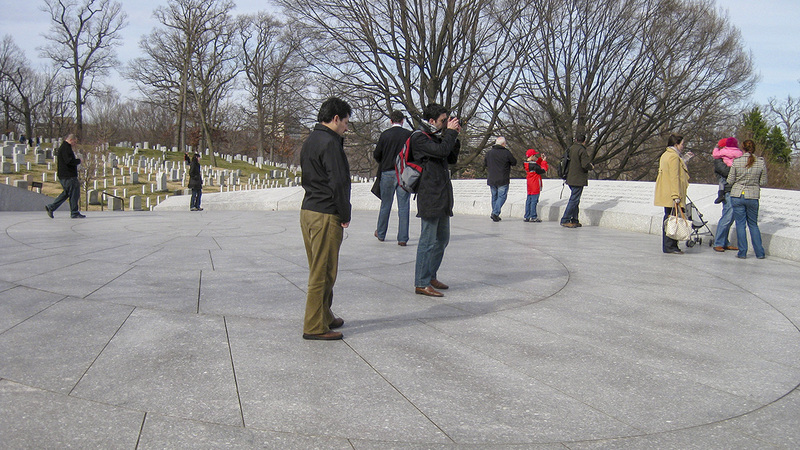 He consulted with a wide range of designers on the gravesite concept, including Isamu Noguchi and the U.S. Commission on Fine Arts. 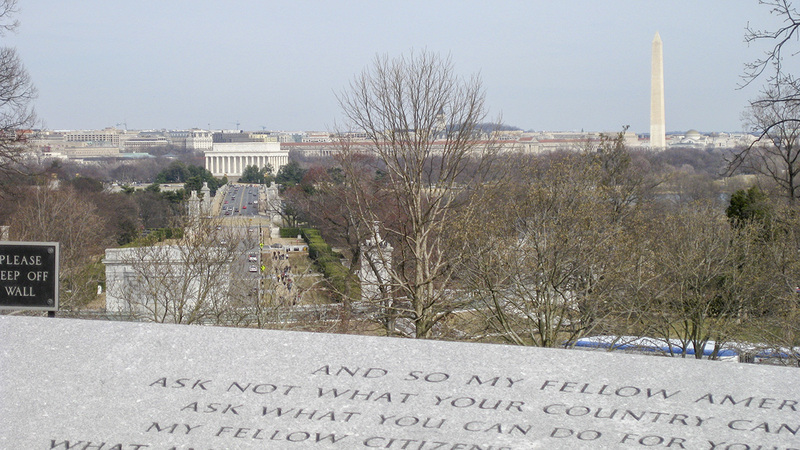 The gravesite occupies a grassy hillside just east and downhill from Arlington House, the Robert E. Lee National Memorial, with views to the Potomac River and Washington, D.C. 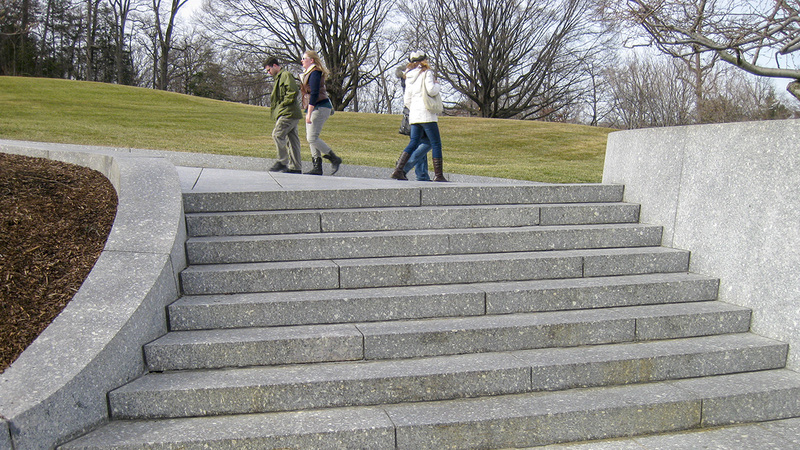 The site is approached from a circular granite entrance ramp that leads up to an elliptical terrace facing the river. Warnecke and landscape architect Michael Painter consulted with Lawrence Halprin and Hideo Sasaki on the entrance design and Rachel Lambert Mellon on planting, which includes magnolia, cherry, and hawthorn trees. 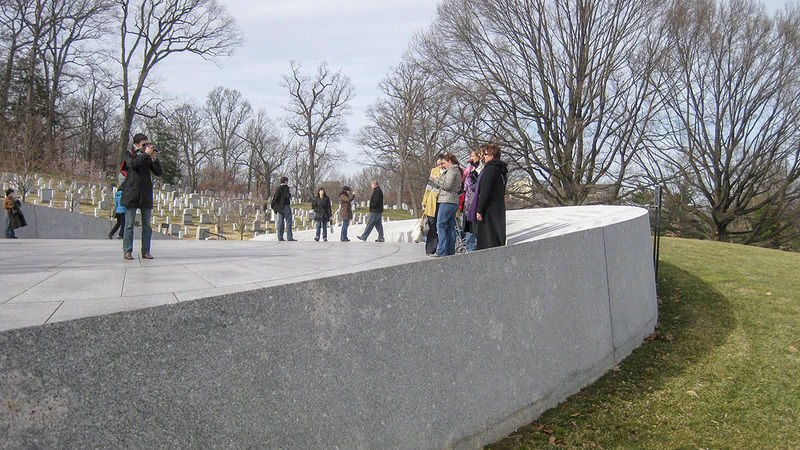 Quotations from Kennedy’s presidency are engraved in the ellipse’s raised edge, a beveled wall that provides a sense of enclosure on the terrace and acts as a retaining wall. 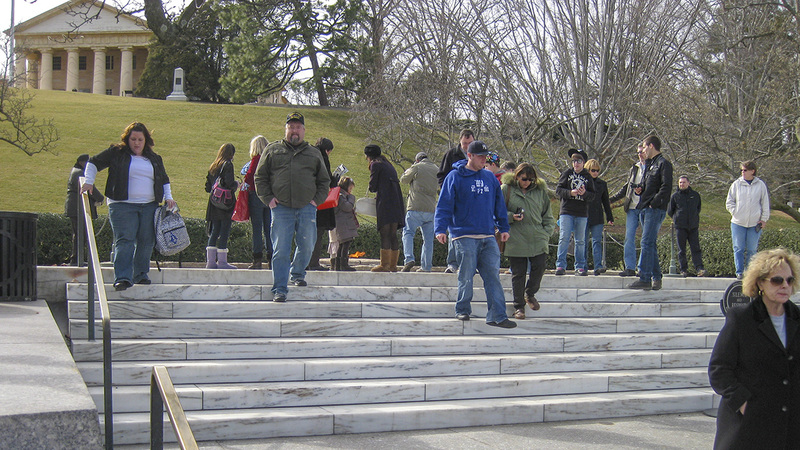 Wide white marble steps lead up to the marble gravesite terrace, at the center of which is a field of rectangular stones set into a lawn panel. 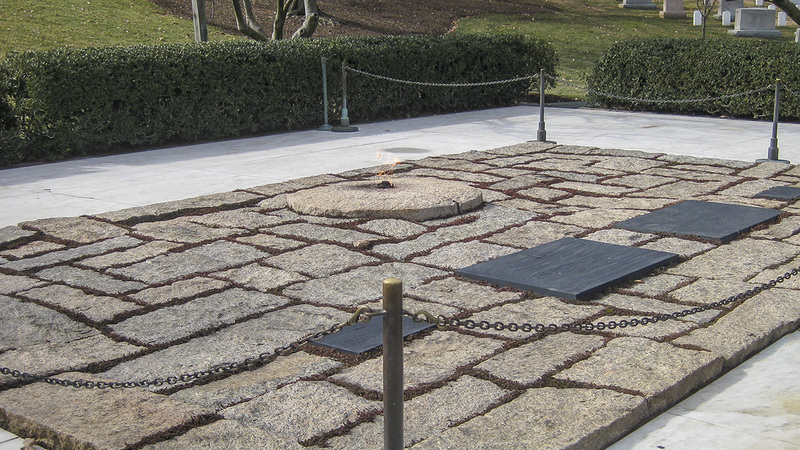 Slate headstones mark the graves of Kennedy, two infant children and his wife Jacqueline Kennedy Onassis. 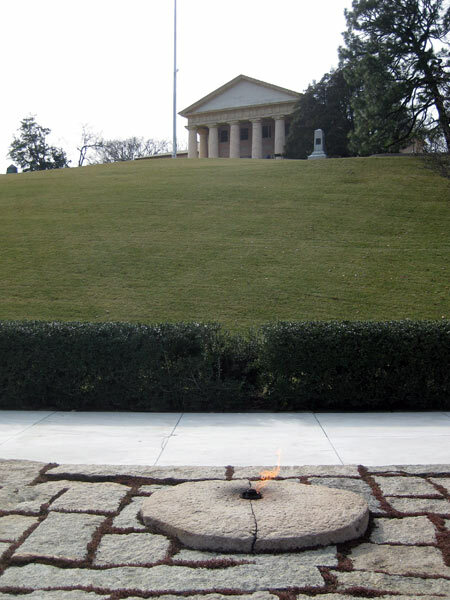 Central to the gravesite terrace is a five foot-diameter round fieldstone font containing the “Eternal Flame,” a gas-powered flame which burns 365 days a year as an enduring reminder of Kennedy’s life and legacy.